Advertising intended to educate the public in the value of real estate as an investment, the desirability of owning a home, or dealing with a member of a recognized real estate board or association is called institutional advertising. Its principal purpose is to create new business in the real estate field or to stimulate activity. Usually such advertising makes no attempt to establish direct contact with the reader, but depends upon the indirect benefit to be derived from an animated market. Institutional advertising usually is cooperative. It is financed by subscriptions from members of real estate boards or associations or by group interests who are concerned in creating a public mind educated to the idea of owning real estate. Not only real estate brokers are benefited by institutional campaigns, but savings and loan associations, building material men, mortgage dealers, architects and others who profit by financing and building homes and business buildings. Publie utility corporations usually are generous supporters of such campaigns. Such campaigns advertise a city or a community as much as they do real estate. Their effect is widespread and they have done much for the benefit of real estate generally. The appeals in this advertisement are apparent. 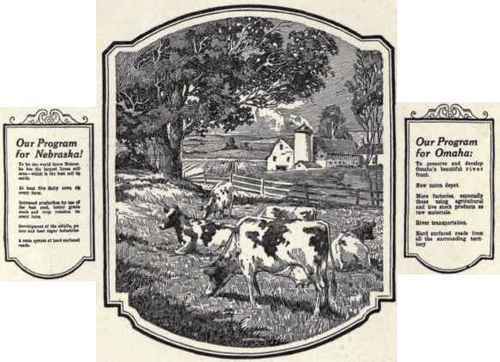 First, curiosity because of the contrast in the drawing and the caption; second, investment; third, the suggestion of comfort and ease given by the farm scene. 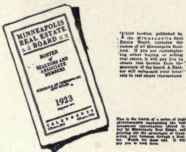 An advertisement designed to educate the public to deal only with members of the Minneapolis Real Estate Board is shown on page 177. The drawing, the caption and the conclusion link the "Realtor" definitely with growing city real estate values. It breathes safety and confidence. The advertisement has character and individuality. After the first paragraph the text is broken into two columns to rest the eye and to facilitate reading. Reference to page 177 should read page 143. Nebraska cows can easily produce $80 each, per year, above the cost of feed, and exclusive of the value of calves, and skim milk. Omaha, where constant and firm city growth comes to such a large degree from Nebraska, wants to see "A Factory on Every Nebraska Farm," for the benefit of both the state and city. Omaha Real Estate Board The Realtors of Omaha lie utility corporations usually are generous supporters of such campaigns. Whatever benefits a trade territory redounds also to deal only with members of the Minneapolis Real Estate Board is shown on page 177. The drawing, the caption and the conclusion link the "Realtor" definitely with growing city real estate values. It breathes safety and confidence. The advertisement has character and individuality. After the first paragraph the text is broken into two columns to rest the eye and to facilitate reading. "One on Every Nebraska Farm "
Every farm which has five or more dairy cows, has a small factory. It is a factory which produces all the time, and for whose products there is a never ending market. Hood business today demands that the manufacturer "get closer to his market"
The Eastern manufacturer it coming to realize that it is cheaper to manufacture nearer the source of both his supply and demand. Decentralization is just beginning. The Ford project, which will bring thousands of new families into the Twin Cities - to buy and build homes, to buy foodstuffs and apparel, and countless other commodities - is an example. 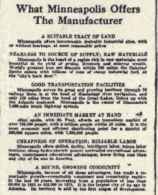 Minneapolis stands on the threshold of a great new era of industrial development. Though Minneapolis today is "A Billion Dollar Market," manufacturing more than 1,800 articles, and receiving from and distributing throughout the Northwest some 600,000 carloads of freight annually, the city is "just arriving." What Minneapolis has done us a great distributing point in the past, she it certain to do as both manufacturer and distributor in the future.